You have to give VWSA’s press fleet manager full marks for psychology. 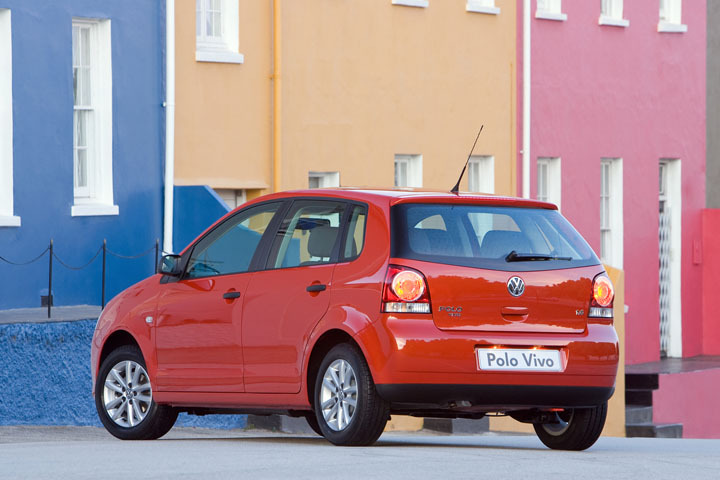 Our Deep Black Pearl Polo Vivo 1,4 Trendline arrived fully loaded with all available visible options, because R135 710 with most of the toys one expects nowadays, is somehow easier to swallow than the same car totally naked at R119 900. The extra R15 810 gets you air conditioning, alarm with central locking (autolocking as soon as you get under way), metallic paint, the smarter of two available radio/CD units and 14” alloy wheels. 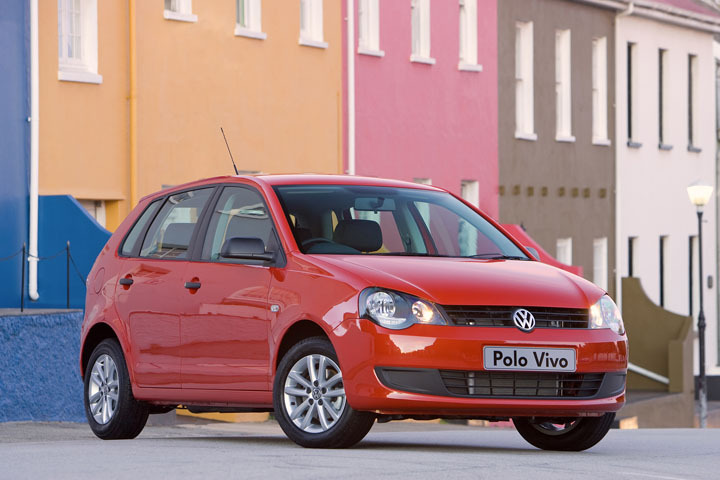 The only other option, common to all Polos, is your choice of 5 year/60 000 km service- or maintenance plans at R7 500 and R8 200 respectively. The outside mirrors and the window winders are fully manual. This is either “good” if you worry about extra stuff to go wrong, or “bad” if like air, music, central locking and, at bare minimum, a service plan, you expect all modern cars to have this kind of thing built in. VW isn’t alone in this strategy; Renault and some others do it too. They offer an extremely basic car at an attractive price, knowing that very few if any, will actually drive away with the bare-bones version. The Vivo is offered as either a hatchback with two or four doors and a choice of three engines (1400 cc in two output levels and a 1600), with two levels of trim, or as a four-door sedan with similar engine and trim choices. Trendline 1400s use the higher-powered 63 kW motor rather than the 55 kW version used in basic models. They also boast ABS with EBD - missing on plain vanilla configurations. Getting in for the first time, I noticed that the driver’s chair is not adjustable for height, but the steering wheel does adjust for both height and reach and there is about a fist-width’s free space between the top of my head and the roof lining – enough, then. Driving position after getting comfortable is more SUV-like than sedan – sort of like driving a bus. Ambience is typical VW, which is to say there’s lots of matt black. Fans prefer this scheme to the mixture of colour and silver found in some other makes. Fit and finish is well done, although I would prefer fewer contrasting textures. The shallow glove box accepts the manufacturer’s literature and not much else, but there are plenty of storage slots and boxes scattered about the cabin. I counted nine in the front alone, in addition to the previously mentioned glove compartment. Cloth upholstery appears to be hardwearing and easy to clean, while entry and exit is a breeze. Front doors open wide, with two intermediate detents to accommodate most circumstances. Gears in the five-speed manual ‘box are nicely spaced, with third a good general purpose gear about town. Cruising in fifth sees about 3 300 rpm on the tachometer at 120 km/h, when engine noise is noticeable but not intrusive. Wind- and road noise is about average for this class of car at this speed. 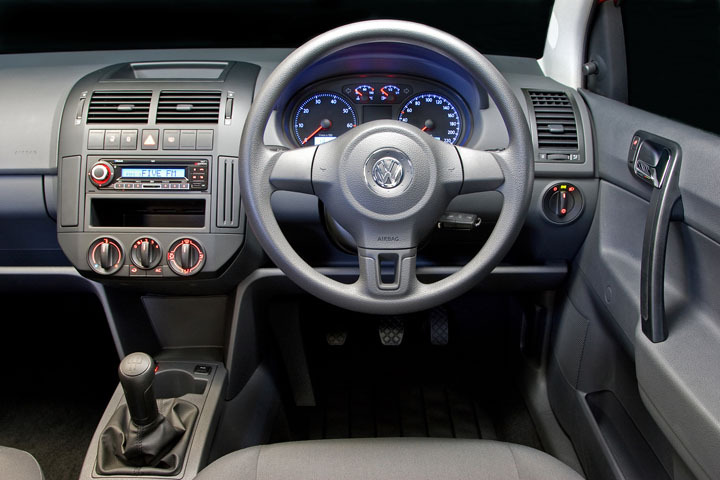 Steering feel is that of a family car rather than of a serious road burner – not a Golf6 by any means, but good for what it is. Moving aft, the back seat offers sufficient knee room in my informal “me seated behind myself” space test, while headroom qualifies as “just enough.” The boot is deep and square, offering 270 litres of space with the seatback upright and 635 litres with it folded down. The loading sill is just above knee level, so getting luggage or groceries in and out is easy. On the road, performance is good for a small family car, maintaining speed comfortably up hills, provided no road bandit forces you into a line of slow moving trucks. At this point, I would guess that the 63 kW motor would be preferable to the 55-kilowatter for long term pleasantness of use. Speaking of pleasantness, this thing laughs at all but the most vulgar of speed humps, so that’s worth a gold star right there. All said, I would rate the Vivo as an excellent modern interpretation of what the Golf used to be before it was moved upmarket and out of reach of its original demographic. My personal opinion is that quoting a dirt-cheap price for a stripped down car few would buy, simply creates feelings of resentment. Rather just say its price is R144 000 with everything and add power windows and mirrors as a gesture of goodwill. I would buy one, then.